Once again I’m the Teacher Appreciation day coordinator for my daughter’s class and so once again I’m on a mission to find cute ideas for classroom gifts. This year I am assembling a book with thank you notes from each of the kids in class telling our classroom teacher why we appreciate her. I thought this would be really easy.. I’d just go to Pinterest, find cute little template, print it out and VOILA. No sweat! Although I could find some printables, they were either too cutesy for 10 year olds, they were intended for the end of the school year, or they were more of generic printable thank you note. Therefore I had to make my own. Of course I figured if I were looking for this type of thing, someone else must be too, so I thought I would share the blank template with you. Even if you aren’t assembling an entire class worth’s of sentiment, just printing these out for your own individual teacher appreciation day gift would be a cute idea. The full sized un-watermarked files are available via email at the end of this post. They are simple enough that smaller kids can fill them out. But the graphics aren’t overly cutesy so that even older kids could use them. 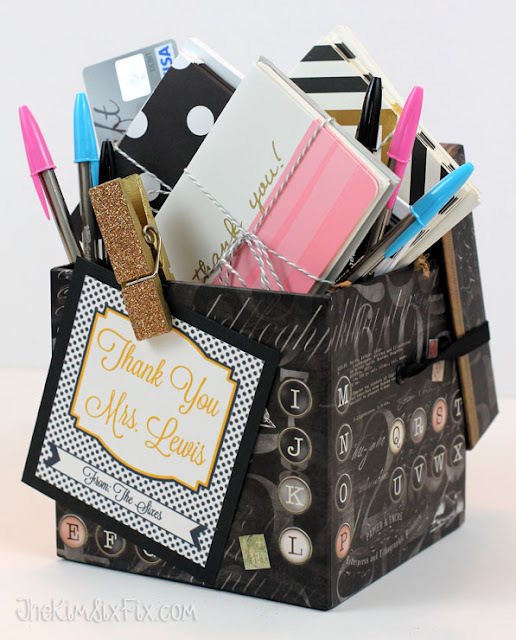 It is an easy and inexpensive way of showing a teacher just how much you appreciate them, and it is gifts from the kids that teachers like best. If you are looking for a gift to go along with your printable thank you, here are some other ideas I have previously featured on the blog!